While often times they’re not the brights you’ll find during summer months, I love the classic, traditional hues autumn brings forth. Navies, reds, deep greens… they have a way of pulling together any outfit in a timeless, classic way. So when I saw this flattering, easy top in one of those shades, a gorgeous musky green, I immediately knew it would be getting a lot of wear! I especially love how the color pairs with the deer print of my favorite fall bag, the St. Anne tote in “Axis,” to give the whole outfit a classic hunting vibe. (You can definitely wear fringe booties while hunting… right?) 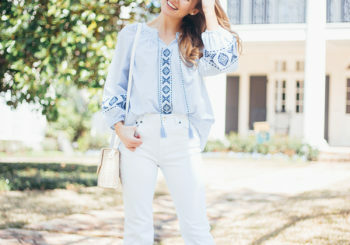 When temperatures drop, you bet I’ll be wearing this top with dark jeans, riding boots and a navy jacket! I’d say that’s a good amount of wear for $32, wouldn’t you? Finally, happy Monday friends! Another week. WOW. I forget how busy and fast-paced fall is. I had such a fun weekend and am feeling refreshed and ready to take on this week. I hope you all are, too! Thanks so much for making me a part of your day. You mean the world! love that idea of fashion. ??? u know what i mean. wear with rdrding boots. Your pictures always turn out so cute! I love that tote by Barrington gifts, I really think I need one! Also, fringe booties are always appropriate for any activity (lol maybe not but they should be!). I love those booties and that purse! Adorable. LOVE this outfit! 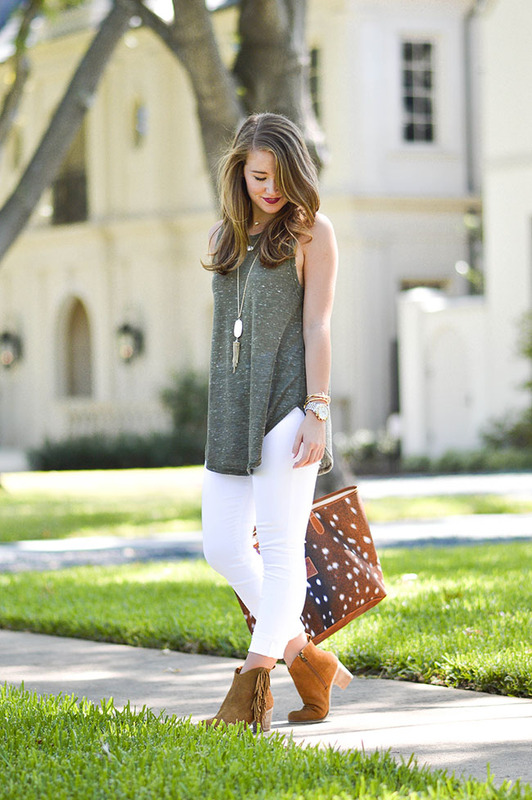 This olive green top is so adorable! This has been my favorite color for fall! 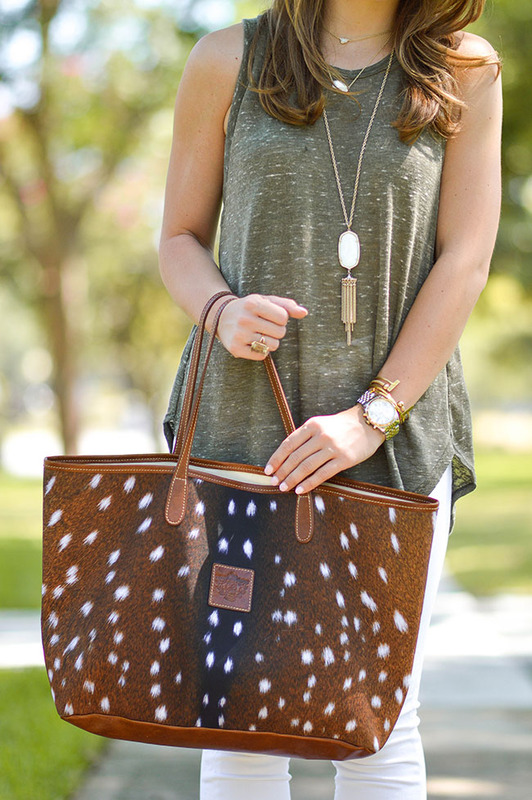 Gasp…that deer print tote is amazing!!! I love tailored cut-offs, they are my favorite! I’m so in love with this look Kate! 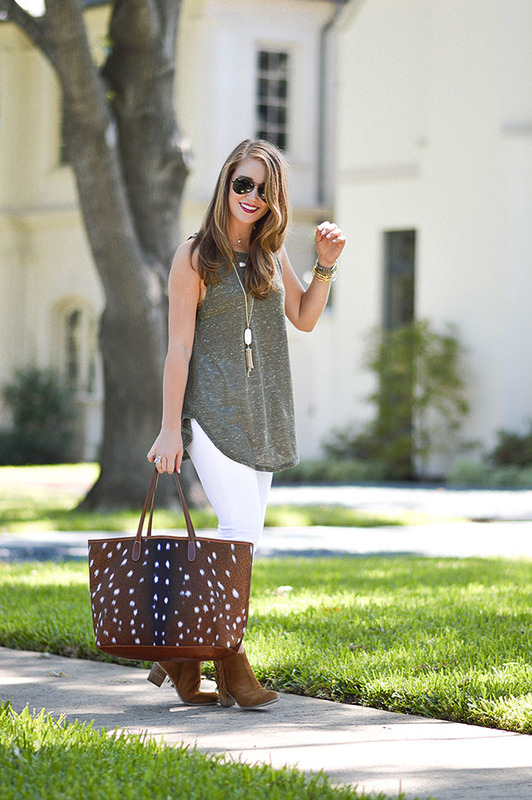 I’m obsessed with that Kendra Scott necklace and love the white jeans! You look so cute, Kate! I love how the outfit is relaxed but also so chic! Those fringe booties = AMAZING!! 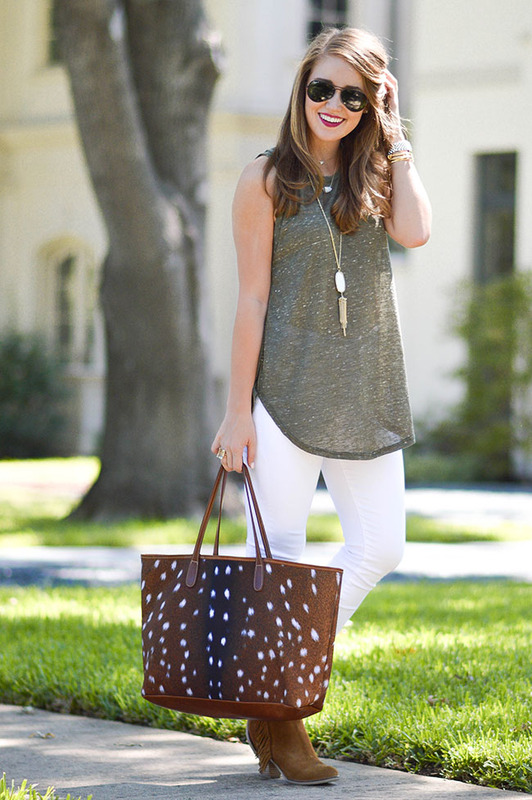 copying this outfit to wear tomorrow… so cute! !